So, why does reduced demand result in fewer people getting to participate into the labor market – having access to earning opportunities at all? Of course this can mean that aggregate supply simply exceeds aggregate demand, because the interest rate is too high. But no matter what the interest rate, companies would still lay off workers when not all of them are needed. We would still have to keep the economy running at its full production capacity to prevent unemployment. This means that even if people preferred to spend and work less, the amount of work done in the economy could not drop! We could not even move towards a fully automated economy where robots do most of the tedious work and people have more freedom to do what inspires them – the kind that people have been dreaming of for centuries. Additionally, most mainstream economists agree that (in the current system) some unemployment is unavoidable. Unemployment rates below a NAIRU level (Non-Accelerating Inflation Rate of Unemployment) of around 5-9 % would cause inflation to hurtle out of control. Unemployment seems to be unavoidable! And, perversely, it is even considered a tool for controlling inflation. This is clearly a market imperfection. In an efficient market, supply should tend towards meeting demand – and that should not be conditional to how much is traded in total. And the relevant question is, how this imperfection can be solved: How can we get work efficiently allocated to people according to their willingness to spend and invest, regardless of aggregate demand! It should not be how we can trick people (or the government) into spending and investing more and more just to keep everyone full-time employed by any means. Probably the most controversial part of the Root Bug hypothesis says that companies piling up work on as few employees as possible has negative economic and social externality effects. In other words, “centralizing work” on few suppliers might be an efficient option for any individual company, but it is not efficient in terms of the whole economy when we require people to produce as much (in market value) as they consume (as a market economy does). Reducing (purchased/employed) labor does not have negative externalities – on the contrary, eliminating waste (unnecessary work) is what allows increasing labor productivity and higher total real income (purchasing power) or more spare time. The problem is that it is not profitable for companies to let everyone participate in the work available, even when they’d be allowed to pay every employee according to her perceived productivity. And hence, the de facto unit of labor is, in most industries, a human being! This quantization of labor into “jobs” makes the economy non-adaptable, fragile and unfair: There isn’t always competition over employees between companies, and hence employees don’t always have options. Sharing work needs to be made legal, socially acceptable and profitable. Mainstream economics has taken it as a natural law that labor exists in these quantized chunks, “jobs”, and that, therefore, allowing everyone to participate in the economy requires that the system runs at its full production capacity. This requires that aggregate demand grows at the same rate as labor productivity increases. Alternatively (or even simultaneously, which is a bit contradictory) some economists assume that employees would have the option to work less if they really wanted to. Unfortunately, they don’t see the game-theoretical problem that exists in reality: Merely asking for a chance to work less can increase an employee’s risks of losing his job – and being stuck long-term unemployed. We could call this the “Consumer’s Dilemma”, which is a kind of “Prisoner’s Dilemma“. When talking about reducing the amounts that individual people work or any kind of “work sharing” (in an economic context), public discourse tends to equate this directly with shortening the legal workweek or otherwise sharing work more equally by force (e.g. by “degrowth” advocates like Peter Victor and Tim Jackson (2009, p. 80). Bu this is hardly optimal, as some people want to spend and/or invest more as well. The alternative would be to simply facilitate working less, by eliminating risks of long-term unemployment and making sharing work profitable for employers. This, together with a working interest rate mechanism keeping the macroeconomy in balance, would allowing people’s earnings to better correlate with their consumption and investment preferences. But this option does not even seem to cross anyone’s mind. Of course, currently, there are lots of artificial fixed costs per employee (mandated in labor legislation and collective agreements) and e.g. labor reduction penalties that increase the risks of recruiting and hence the costs of sharing work. But even without them, “natural” overhead costs (training, management, selection etc.) would still make it more profitable for companies to minimize their headcount and pile up work on current employees (which is often easy due to a constant fear of unemployment). 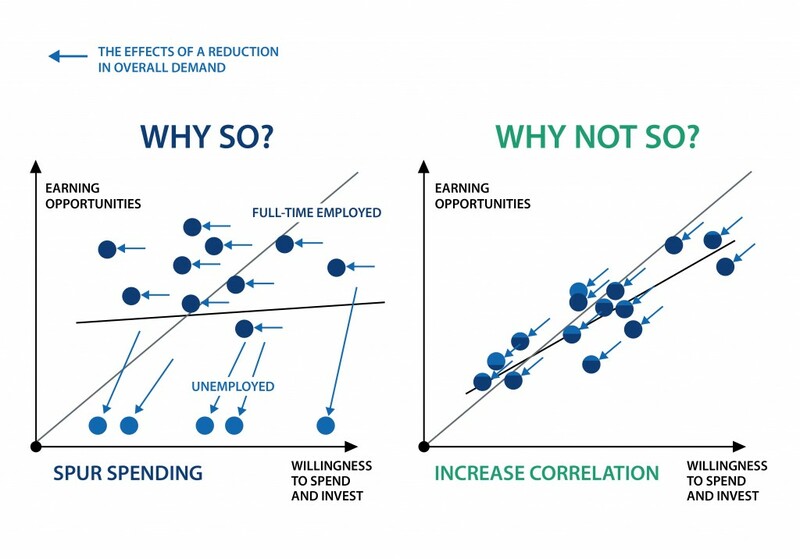 Paradoxically, employees only have room to negotiate for working less in sectors with a labor deficit, which makes the labor deficit even worse – especially in situations where deficit results from limited education opportunities. The need for social security systems and how to implement them so that they do not cannibalize anyone’s incentive to work – including discussion on the challenges and potential future of a citizen’s dividend). The ways in which this small change in rules, making sharing work profitable, would turn many economic phenomena, causalities and power structures upside down are discussed in volume 3 in Fixing the Root Bug (and briefly in the Why section of this site).